The roots of the Group C category lie in both FIA Group 6 and particularly in the GTP category introduced by the ACO at Le Mans in the mid-1970s. GTP was a class for roofed prototypes with certain dimensional restrictions, but instead of the more usual limits on engine capacity, it placed limits on fuel consumption. The FIA applied the same concept in its Group C rules. It limited cars to a minimum weight of 800kg and a maximum fuel capacity of 100 litres. With competitors restricted to five refueling stops within a 1000 kilometer distance, the cars were effectively allowed 600 litres per 1000 kilometers. By 1989, the Group C series popularity was nearly as great as Formula One. When C1 cars were found to be breaking over the 240 miles per hour mark at Le Mans' Mulsanne Straight — the WM Peugeot recorded the highest at 254 mph (over 400 km/h) — the FIA revolutionized the class by attempting to turn it into a formula series to replace the C2 category (after they proved to be unreliable at endurance races). The new formula restricted the performance of cars built to the original rules (such as the Porsche 962 used by many privateers) and benefited teams using F1-sourced 3.5 L engines — these latter teams being effectively the large manufacturers alone, as the new formula cars were more expensive than the C1 cars. What followed was the quick downfall of Group C, as Ford, Mercedes and Peugeot elected to either concentrate on or move to F1 directly, while F1 engines were unaffordable for privateer teams like Spice and ADA. 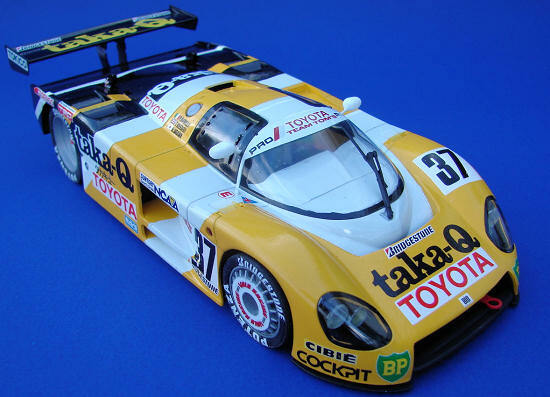 The 1994 24 Hours of Le Mans was the last one in which Group C cars were permitted. 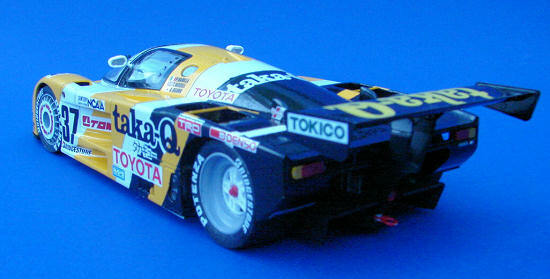 For 1988, the Toyota 88C was raced. It was a development of the 87C and cars differed from race to race. 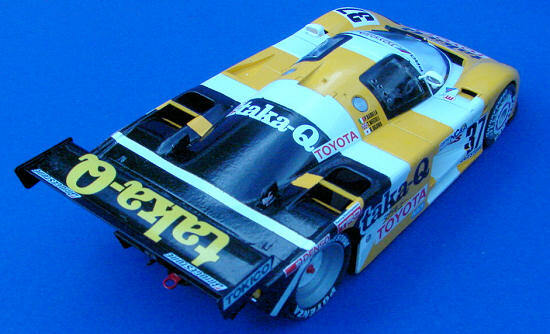 The subject of this kit, the #37 Taka-Q car, posted a best finish of 5th place. While it wasn’t a big LeMans winner, later versions of the chassis when on to great success in the IMSA GTP series. Most of the kit is molded in white with the body is molded in a somewhat see-through yellow. The large decal sheet includes all the white areas of the body and appears to be nicely done. There are different side pods and some decals not used, so there may be other versions available. Decals are supplied for the tires and they are NOT dry-transfers. They work similar to dry-transfers, with removable backings, but require wetting to stick to the tires. The “Potenza” emblems are a bit to big for the front tires. For a look at the bits, please visit the preview. First up was the chassis. Most of it is painted flat black so a lot of it can be assembled before painting. There is very little detail here, so assembly went quickly. The differential was assembled, painted aluminum and then glued to the rear section. I then painted the cockpit aluminum and attached it to the chassis. The seat was painted flat black, with the molded in belts painted flat red. The instrument panel is attached to the underside of the body shell. I attached this after the chassis was finished and then the body was test fit to make sure the panel was centered properly, as the shifter passes through it. The gauges are all done with decals and the result is quite nice. I then started on the tires. I messed up one of the rear wheels when I tried to glue the front wheel cover to the wrong rim. OOPS! I pa inted the rims and assembled them as called for in the instructions and then mounted the tires. At this point I added the tire emblems. They work like dry-transfers, but require water to stick. They are mounted to a backing that is removed from the main sheet. A protective “cover” sheet is then removed, exposing the emblem attached to a see-through backing. The emblem is positioned on the tire and water applied. The backing is then carefully removed and the emblem sticks to the tire. I added water after positioning the emblem, but I suppose you could wet the tire first. I assembled the various body inserts and added the tailpiece. On this part I would deviate from the instructions. There are two panels available for the left side, one with louvers and one without louvers. Even though it is incorrect, I would install the one without louvers, as it is impossible to get the decals to conform to the one with louvers. I then sanded down whatever seams there were and I was ready for paint. After painting and decaling, the body was attached to the chassis and the rear wing was added. I decided early on to paint the body as opposed to using the white decals. I debated painting the white or yellow first, but I figure 6 of one a half dozen of the other. I painted the yellow first. Once the yellow was dry I masked it off and painted the white. I then masked it off again and painted the black. The masking is difficult around the door areas but I was unwilling to take the risk the white decals wouldn’t cover properly. Turns out, I did the right thing. Even if I had used the white decals, some masking would still be necessary. The decal sheet for this kit is BIG. It contains a total of 65 decals, although some of those are the white body sections. All the white areas on the car that require a decal have a white decal for a background that must be installed first. Why Hasegawa did it this way is beyond me, but it makes decaling the body a PITA. (I suspect it is to help prevent the underlying color from being visible through the decal. Ed) The only decals I had trouble with were the car numbers and their white backgrounds. Even after solvent, they would not conform to the body. I ended up having to slice them to get them to settle. The white decal areas are a bit transparent, but most of the ones I used fall on a single color and don’t look too bad. All in all not a bad model. The paint job may put off some people, but there are always the decals. I would have liked to have a bit of engine detail but it builds easy and is a kit kids, as well as serious car builders, will enjoy. If you opt to paint the car as I did, photocopy the decal sheet and use it to mask off ALL the white areas. If I had studied the decals closer, that’s what I would have done. Thanks to your editor for providing the review kit.